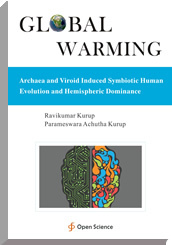 Global warming leads to endosymbiotic archaeal growth and changes in brain structure. This leads to changes in hemispheric dominance. The increase in endosymbiotic archaeal growth in the neuronal cells leads to right hemispheric dominance and neanderthalisation of the species. Homo sapien species has decreased density of endosymbiotic archaeal growth in neuronal networks and are left hemispheric dominance. Hemispheric dominance is modulated by symbiotic evolution.